The highlight race of the Santa Anita fall meeting is the $300,000 Awesome Again Stakes (G1), featuring the best older horses of the west coast going 1 1/8 miles on the main track, and is a Breeders' Cup Challenge "Win and You're In" qualifier for the Breeders' Cup Classic. Just 16,801 fans came to the Arcadia oval on Saturday afternoon under sunny skies and temperatures in the high 80's. 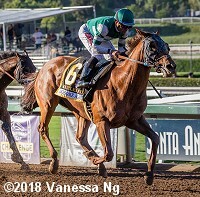 Accelerate was sent off as the 3-10 favorite in the field of 6 off wins in the Gold Cup (G1) and the Pacific Classic (G1). 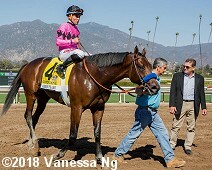 In to challenge him included 8-5 second choice West Coast, unraced since 2nd in the Pegasus World Cup (G1) and Dubai World Cup (G1), and 21-1 third choice Prime Attraction, 3rd in the Pacific Classic. 57-1 Shades of Victory was quickest away through an opening quarter of 22.89 before West Coast took over on the clubhouse turn through a half in 46.17 and 3/4 in 1:10.35 while pressed by 58-1 longest shot Isotherm and stalked by Accelerate. Entering the stretch, jockey Joel Rosario moved Accelerate 4 wide for room, and he took over at the 1/8 pole through 1 mile in 1:36.70. Kept to task by Rosario, Accelerate drew off to win by 2 1/4 lengths over West Coast in 1:50.38. It was another 1/2 length back to Isotherm third. Left: Accelerate in the winner's circle. 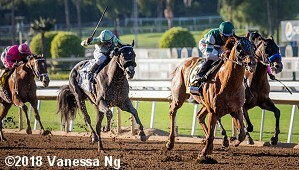 Winning trainer John Sadler said, "He kind of missed the break. I should have taken him one more time to the gate to stand. But, he overcame it, got a nice clean trip and the best horse prevailed today. I felt good when he was clear all the way around there. He's got a good kick. You're always nervous in these races. He's run so well and he's been so consistent so you always hope he stays consistent so we're very happy. Breeders' Cup is obviously next up. We'll train here at home and then go and follow Bob Baffert over there to Churchill about a week before. We'll kind of walk behind Bob and creep up on him. Another thing I'm looking forward to is that we know this horse likes an off racetrack and it rains over there (Kentucky). He's just a solid horse. He's a late foal and he's continued to thrive. He had a good four-year-old year and he's having a better five-year-old year. He's just in peak condition." Right: Accelerate heads back to the barns. Winning jockey Joel Rosario said, "He left the gate slow, but he recovered nicely. John told me he is a little slow to get going, so I just made sure we got ourselves in the game right away. I just wanted to get position and my horse was going comfortably. He loves to run. He was waiting on the turn and then he took off. He's a really special horse and I'm thankful John gave me the opportunity to ride him the last two times." Owner Josta Hronis added, "He was feisty in the gate. I think the guy grabbed him a little and he didn't like that. According to Joel he was upset when he broke, but as long as he wasn't boxed in, I felt the best horse was going to win." Left: Second place finisher West Coast in the paddock before the race. 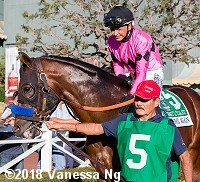 Jockey Mike Smith said, "He really ran a huge race and had an incredible run. I couldn't ask for more out of him. He really needed that push and we forced him to move forward a little more but I think that he did well and it was good for him. He should move forward and I think forcing him a little more really helped him and it was just what he needed. Overall he did good and really gave us a great run." Right: Third place finisher Isotherm in the post parade. The Phil D'Amato trainee improved his record to 3 wins, 3 seconds, and 4 thirds in 21 starts, earning $498,259 for owner Matthew Schera. 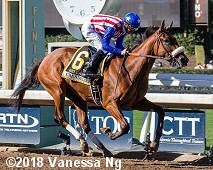 The $300,000 Chandelier Stakes (G1) featured 5 two-year-old fillies going 1 1/16 miles looking for automatic entry into the Breeders' Cup Juvenile Fillies. Sorrento (G2) and Del Mar Debutante (G1) winner Bellafina was sent off as the 9-10 favorite over 2-1 Der Lu, a debut winner last out, and 5-1 Brill, 4th in the Del Mar Debutante. 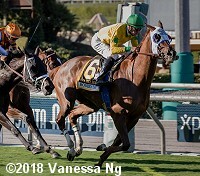 Jockey Joel Rosario sent 10-1 Vibrance to the lead first time by through fractions of 22.88 and 46.51 while pressed by Bellafina and stalked by Der Lu. On the far turn jockey Flavien Prat sent Bellafina to lead through 3/4 in 1:11.12. Into the lane Bellafina left the field in her wake, drawing off to win by 6 1/2 lengths over Vibrance in 1:44.59. It was another 4 1/2 lengths back to Brill third. Left: Bellafina in the winner's circle. 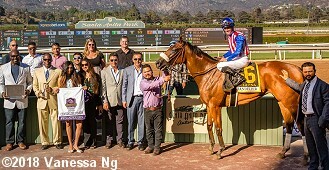 Winning trainer Simon Callaghan said, "When she had the blinkers on, she was a little more tense. She switched leads and did everything right, and she dominated today. She's answered every question. We've jumped from 5/8 to 3/4 to 7/8 and now to 1 1/16. That's what the good ones do � they've got the speed but they can also get the extra distance." 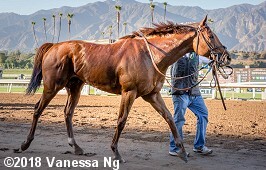 Owner Kaleem Shah added, "It is certainly very exciting to see her come down the stretch. Everyone has been talking about her switching leads and she certainly did it. I think taking the blinkers off certainly helped her but it's what Simon has been expecting all along. It was Simon's decision to take the blinkers off. I hope she goes far from this day forward." Right: Bellafina returns to the barn after the race. Winning jockey Flavien Prat said, "That was great. Simon and all of his team, they did a great job with her. Last time out, she was pretty aggressive. They took off the blinkers and did some work in the mornings and she ran much better today than at Del Mar (in the Del Mar Debutante Sept. 1.) She was much better in the race today; she relaxed and did everything right." Left: Second place finisher Vibrance in the paddock. Jockey Joel Rosario said, "She broke really well and wanted the lead but then started looking around. She ran really well but the winner was much the best." Owner Aron Wellman added, "We ran into a buzzsaw, no question. The race didn't set up the way we thought it would, but Joel did the right thing. He got a flyer coming out of the gate and he just went on with it, which was the right thing. The winner is really special, but we got Grade 1 black type and, touch wood, we'll go on to the Breeders' Cup from here. She should move forward off this." Right: Third place finisher Brill returns after the race. The Jerry Hollendorfer trainee improved her record to 1 win, 0 seconds, and 1 third in 3 starts, earning $90,000 for owner OXO Equine LLC. 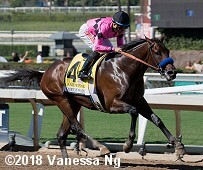 Kicking off the stakes quintet was the $300,000 American Pharoah Stakes (G1) (formerly the FrontRunner) for 2-year-olds going 1 1/16 miles looking for automatic entry into the Breeders' Cup Juvenile. Del Mar Futurity (G1) winner Game Winner was the 3-10 favorite in the field of 5 over 3-1 Gunmetal Gray, a maiden winner last out, and 5-1 Rowayton, 2nd in the Del Mar Futurity. 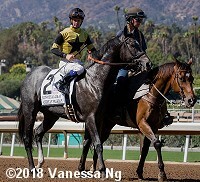 Jockey Florent Geroux sent Rowayton to lead through fractions of 23.43, 47.50, and 1:11.85 while pressed by Game Winner and stalked by Gunmetal Gray. 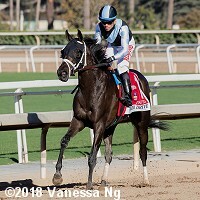 Turning for home, jockey Joel Rosario sent Game Winner to challenge and he easily passed Gunmetal Gray, drawing off late to win by 4 1/2 lengths in 1:43.77. It was another length back to Rowayton third. Left: Game Winner in the winner's circle. 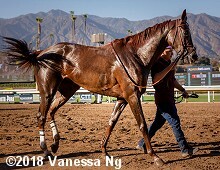 Winning trainer Bob Baffert said, This horse tipped us off this summer that he was going to be a good one. He is strong and he still looks a little heavy. It's exciting to have this horse. These horses sort themselves out. Circumstances dictate who gets there. 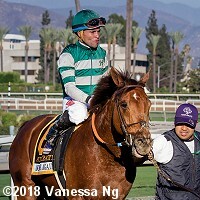 I had one bullet here and I just want to keep him healthy; I don't plan to do too much with him before the Breeders Cup. The good ones get there. I was very happy to win the first American Pharoah. Pretty cool and nice of Santa Anita to name a race after him. We had the same groom on this horse as American Pharoah (Eduardo Luna)." Right: Game Winner heads back to the barn after the race. Winning jockey Joel Rosario said, "He broke well out of there. I just chirped at him a little bit, put him on the outside, and he responded to that really well. I wasn't trying to be too far back and that worked out. He's a very good horse. He kinda just waits for other horses, he's a one run horse. He stays galloping and kinda waited for some company. He's an easy horse to ride, I was just a passenger today." Left: Second place finisher Gunmetal Gray in the post parade. Jockey Flavien Prat said, "It was a good run. We had a good trip and he made a nice run down the lane. The winner was just better than us today." 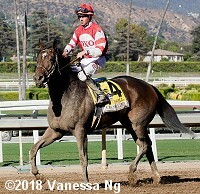 Trainer Jerry Hollendorfer added, "No excuse for running second. I don't know yet whether we'll go to Churchill Downs for the Breeders' Cup." Right: Third place finisher Rowayton in the paddock before the race. The Jerry Hollendorfer trainee improved his record to 1 win, 1 second, and 1 third in 3 starts, earning $132,000 for owner OXO Equine LLC. 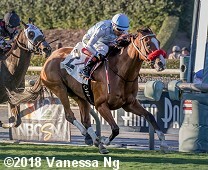 The $300,000 Rodeo Drive Stakes (G1) featured a field of 8 older fillies and mares going 1 1/4 miles on the turf, looking for automatic entry into the Breeders' Cup Filly and Mare Turf. Vasilika was sent off as the 8-5 favorite off a 6 race win streak including the John C. Mabee (G2) last out. 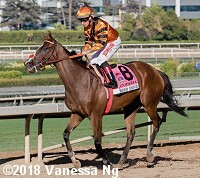 In to challenge her included 7-4 second choice Cambodia, winner of the Yellow Ribbon (G2) but 2nd in the Mabee, and 4-1 third choice Paved, 6th in the Del Mar Oaks (G1) after finishing 8th in the Belmont Oaks (G1). Jockey Tyler Conner sent 54-1 Tisbutadream to the lead first time by through fractions of 23.61, 46.78, and 1:10.42 while pressed by Cambodia and stalked by 11-1 Queen Blossom. Entering the stretch, Tisbutadream tired allowing Cambodia to inherit the lead through 1 mile in 1:34.88. Cambodia led to midstretch but Vasilika, 4th early under Flavien Prat, rallied to the front at the 1/16 and held off late-running Paved by 1/2 a length in 1:59.04. It was another 1/2 length back to Cambodia third. 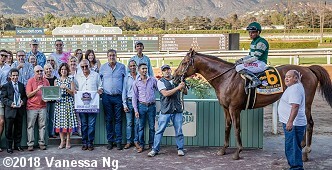 Left: Vasilika in the winner's circle. 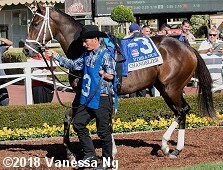 Winning trainer Jerry Hollendorfer said, "We were just looking for a horse that can win a race. I think there are no secrets to this, sometimes horses get good, they go to a different spot and get better for one reason or another. It doesn't mean that we did a better job; it's just she likes it better where she is right now. 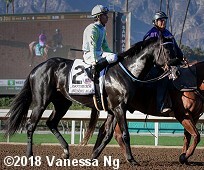 We'll probably talk about [heading to the Breeders' Cup]; we're not nominated but I think it's feasible to nominate her. We'll have to do our homework and see if we're going to do that or not." 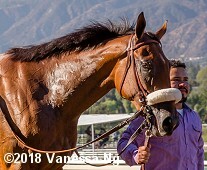 Right: Vasilika returns to the barn after the race. Winning jockey Flavien Prat said, "We were going a little slower than I thought. She is super-easy to handle. I knew once she switched leads, we were going to catch Cambodia. I saw Rosario's horse (Paved), but we kept on going. This horse keeps getting better and better. She doesn't quit and she's got a ton of foot." Co-owner Dan Gatto added, This is my very first Grade 1. We've won Grade 2 and 3 but we've never won a Grade 1 and we've tried. We had a horse by the name of Parranda and she lost this race by a half-length in 2014. This is really good redemption, this feels good. That stretch run was fantastic. She's got such an amazing turn of foot." Left: Second place finisher Paved returns after the race. Jockey Joel Rosario said, "It looked like I was going to go by that horse, but the horse in front just kept fighting. 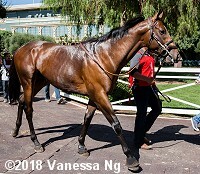 My filly ran well. It was a great effort." Right: Third place finisher Cambodia returns after the race. Jockey Drayden Van Dyke said, "She ran a really, really good race. I just wish I could have been able to get her to relax a little better today. She ran a really good race, but she would've finished up better." The last race on Saturday was the $75,000 Unzip Me Stakes for 3-year-old fillies sprinting 6 1/2 furlongs on the downhill turf. Ms Bad Behavior was the even-money choice in the field of 12 over 6-1 Hey Negrita and 7-1 Out of the Flames. 16-1 Suspicious Spouse and 21-1 Travieza dueled down the hill through fractions of 21.79 and 43.42. In the stretch, Travieza opened up a 3 length lead through 3/4 in 1:06.22, and easily held off late-running favorite Ms Bad Behavior to win by 1 1/4 lengths in 1:12.42. It was a neck back to 27-1 Spiced Perfection third.